This will be build report on my first Quadcopter. I will be using a HJ X-Mode Alien frame. Here are its specs. 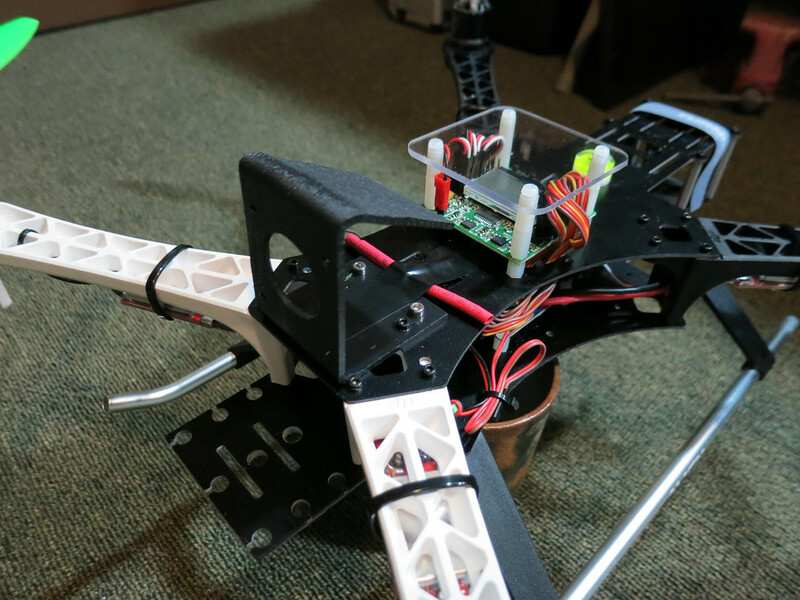 The Photo Gallery for this Quadcopter can be found HERE. Video of maiden flight can be seen HERE. This is a low cost frame, but had a design that I liked. 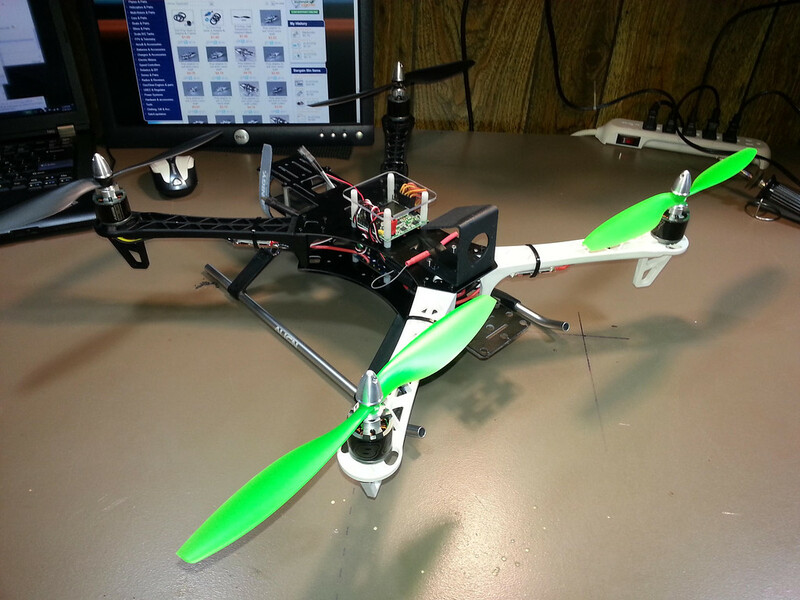 I plan to add a GoPro camera and other FPV gear to this quadcopter. So I needed alot of space to mount things. 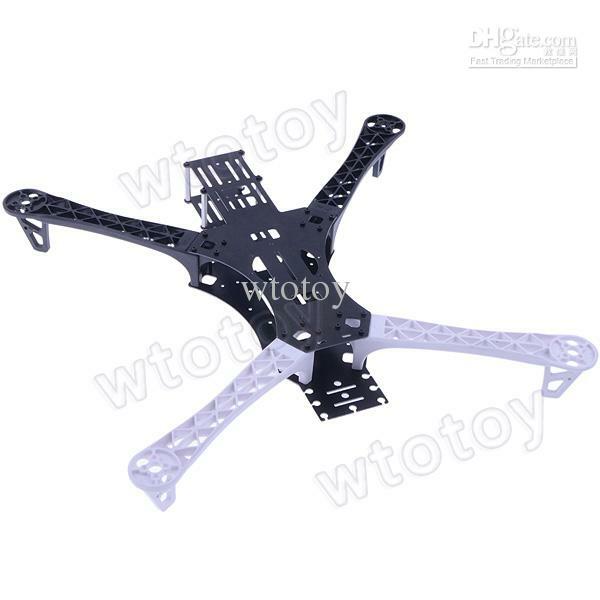 This frame uses the same style and design arms as the DJI brand, but I have read that the DJI arms are must stiffer and stronger. So I ordered a set of those to use in place of the stop HJ arms. Figure I will keep the HJ arms as spares. 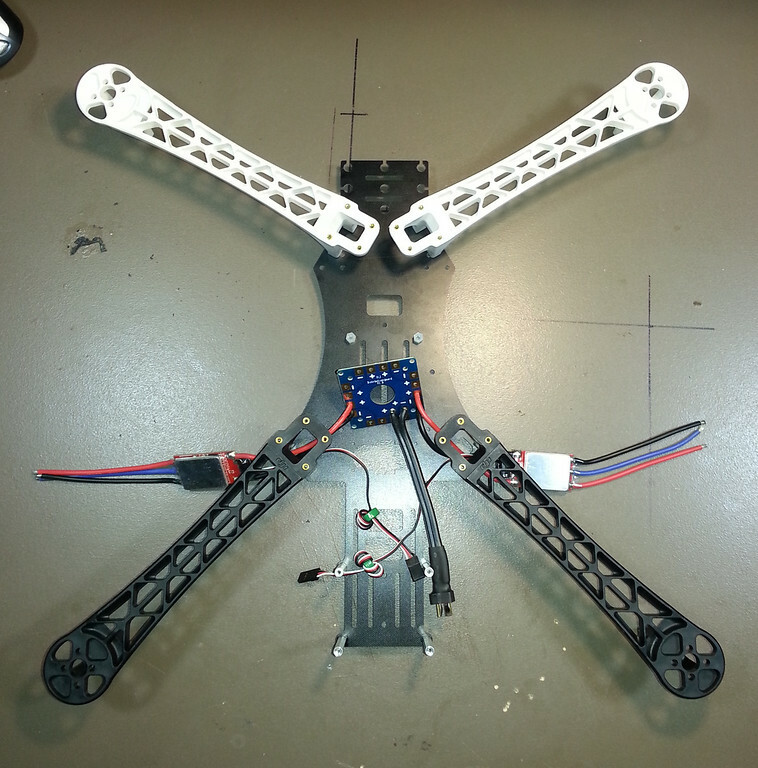 Here is a link to a spreadsheet showing all the parts I am using on this quadcopter. Most of the parts were bought from websites based overseas, so there is quite a wait for the parts to arrive, which is killing me. This is my first time building a quadcopter, so there was a bit of startup cost. Such as the radio, a few tools, various screw, nuts and bolts. But I was surprised at how little the actual quadcopter itself was going to cost, considering I chose some decent, but not top end parts for it. Should certainly do what I need it to do, and be a nice beginner setup. I will post progress here as I build progresses and I will comment on anything I run into, or tips I might have. 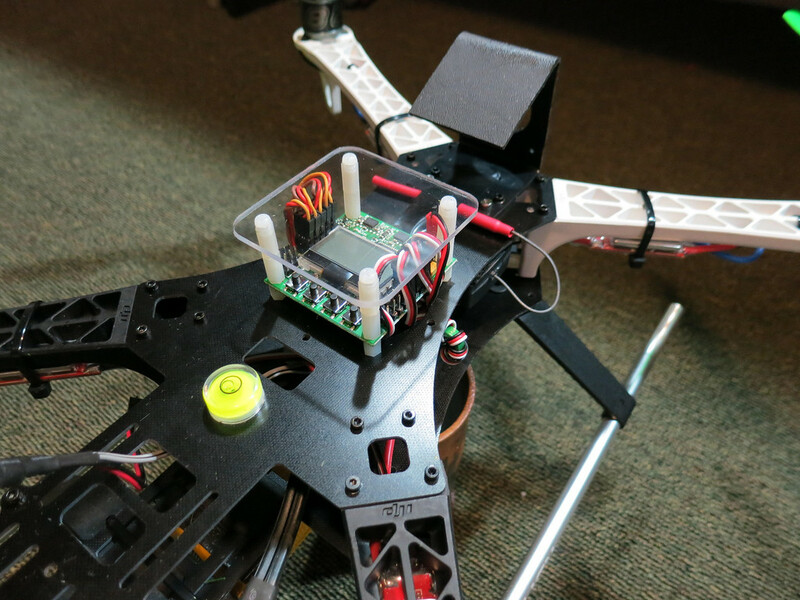 Here are a few links with some great information if you are starting out and need to learn how to build and setup a quadcopter. Here are a couple videos on setting them up. The HJ X-Mode frame arrived today so I got started on the build. I still have alot of parts that have not arrived yet, but I did what I could. The first thing I did was use a template I made of the arm mounting holes, to drill a second set of holes that will allow me to angle the front arms back more. I am going to use the stock mounting holes for now but wanted to go ahead and set it up so I have the option later on if I need it. 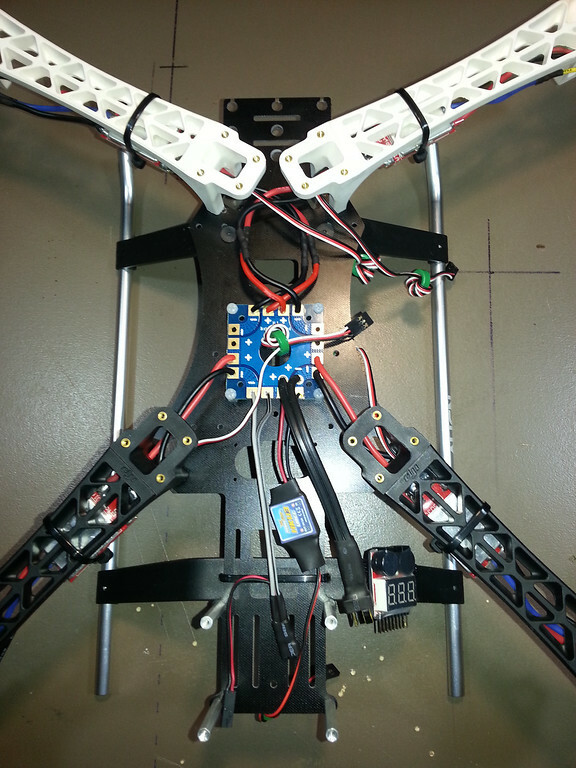 Next I mounted the arms to the bottom frame plate and started to solder the rear ESCs to the power distribution board. The front ESC power wires will have to be extended just a tiny bit. 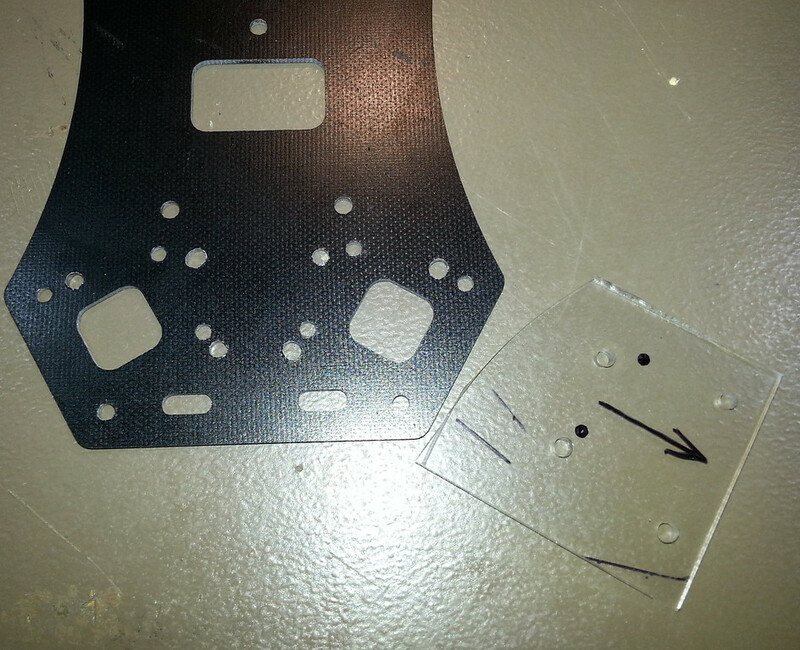 Next I mounted the Align 700 Heli landing skid to the bottom frame plate. This is not needed since the arms have little feet of their own. But I wanted something that sat the frame a bit higher off the ground that would give better clearance for a GoPro mount and future gimbal. This would also take stress off the arms when landing. After impatiently waiting a couple weeks for the rest of my parts to arrive, I got back to work on assembly. 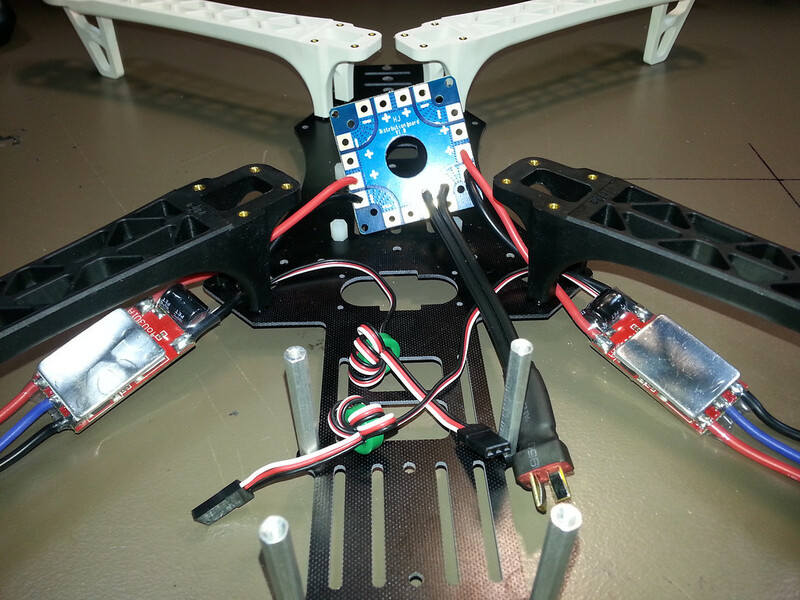 I mounted the NTM 900kv motors on the DJI arms and them soldered them to the ESCs. You can also use bullet connectors here but I didnt want the added bulk or weight of them. Remember that motors 2 and 4 need to be running in reverse. So instead of matching up the wires from motor to ESC, on motors 2 and 4 I left black connected to black, but swapped the other 2 wires. 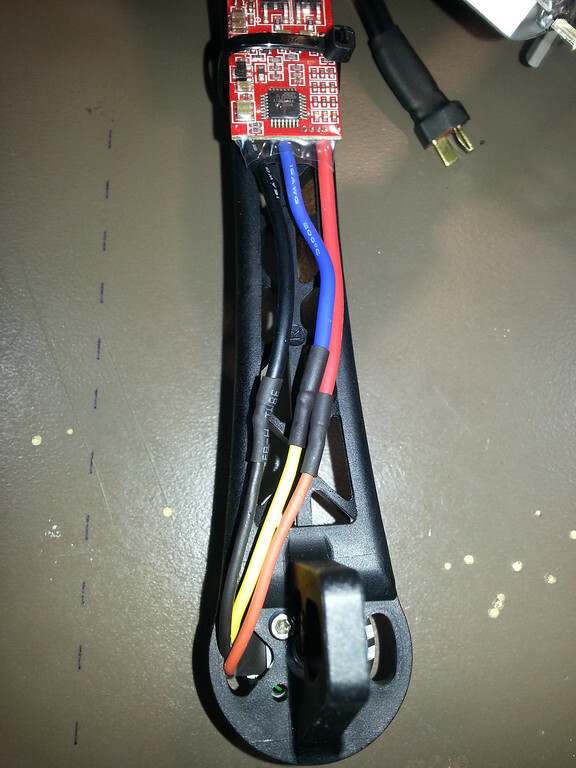 As you can see the color wires used on motors and ESCs wont always be the same. Just keep track of how you are wiring the regular vs. reserved rotation motors. Next I continued soldering all the connections to the PDB (power distribution board). 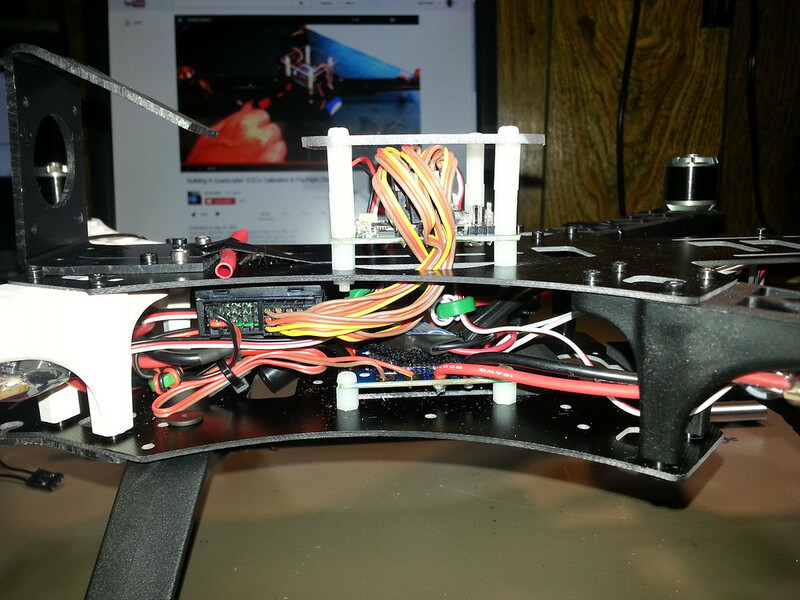 I had to lengthen the wires on 2 of the ESCs to get them to reach. The BEC is also soldered to the PDB and it will feed power to the KK2 controller board. The ESCs I am using also have BECs built into them, so this is redundant, but shouldnt hurt anything. 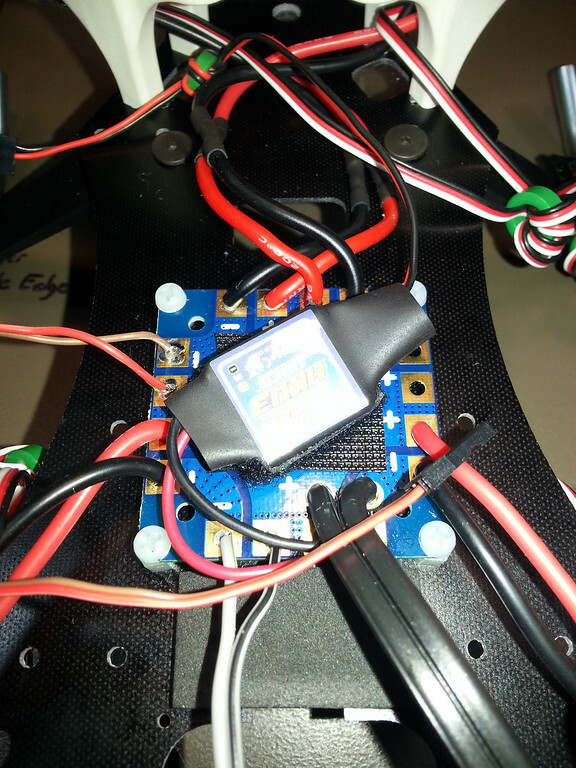 Some people like to use a BEC and disconnect the power lead wires from the ESCs to the control board. 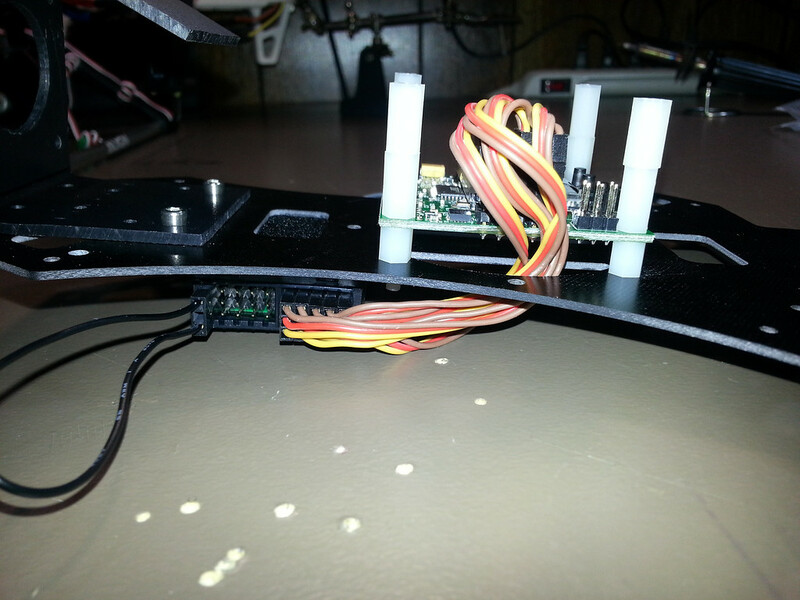 The wire harness for powering the ImmersionRC 600mW video TX is also soldered to the PDB. Along with a spare JST connector for adding LED lights later. Next I mounted the KK2 board and RX to the top frame plate and connected all wires. I read mixed things on whether you should mount the KK2 board firmly to the frame or if it should be mounted on vibration dampening material. For now I am hard mounting it with standoffs. 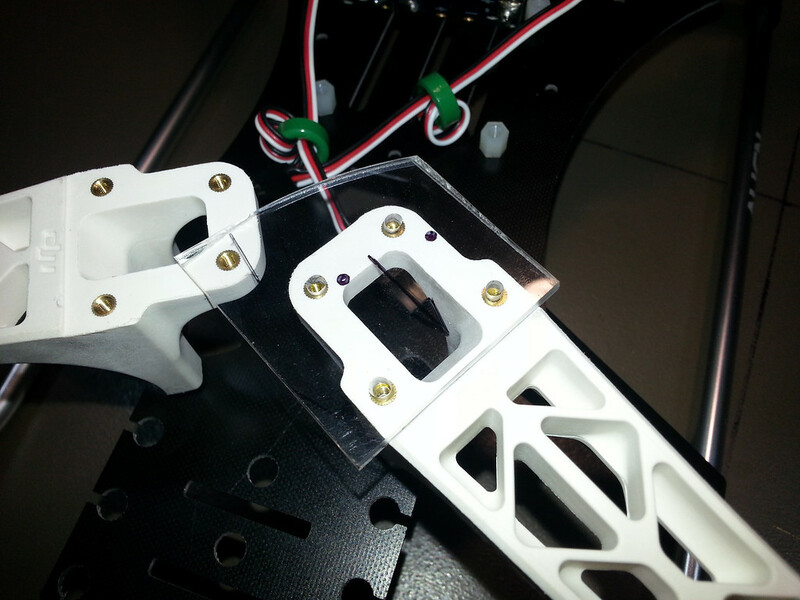 There are standoffs on top the KK2 that a lexan plate will be mounted to. 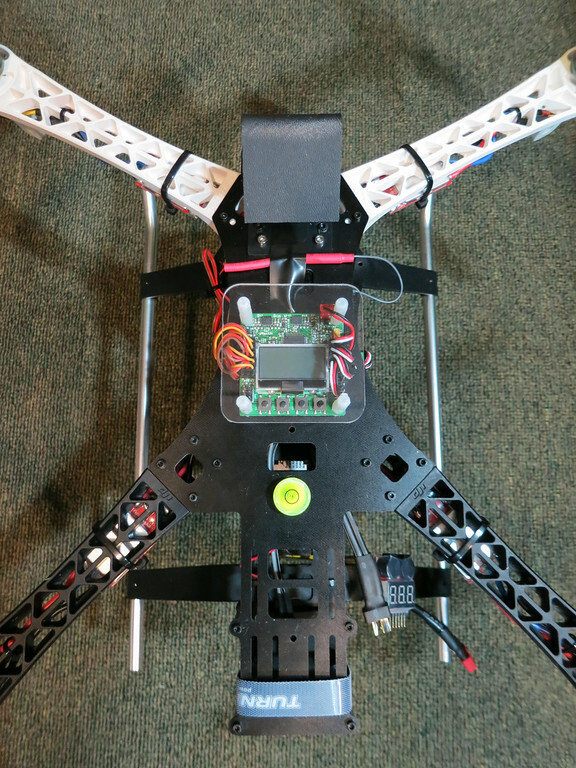 The top frame plate was bolts on next and I connected the wires from the ESCs. There is a ton of room on this frame for getting all the wires to fit was pretty easy. Although a couple of the ESC wires were barely long enough. I still need to clean it up a bit, add a few zip ties here and there. The RX antenna is just taped on top the frame for now also, need to find a nice way to mount it. I glued a small bubble level on the top of the frame to help when calibrating the self level sensors on the KK2 board. 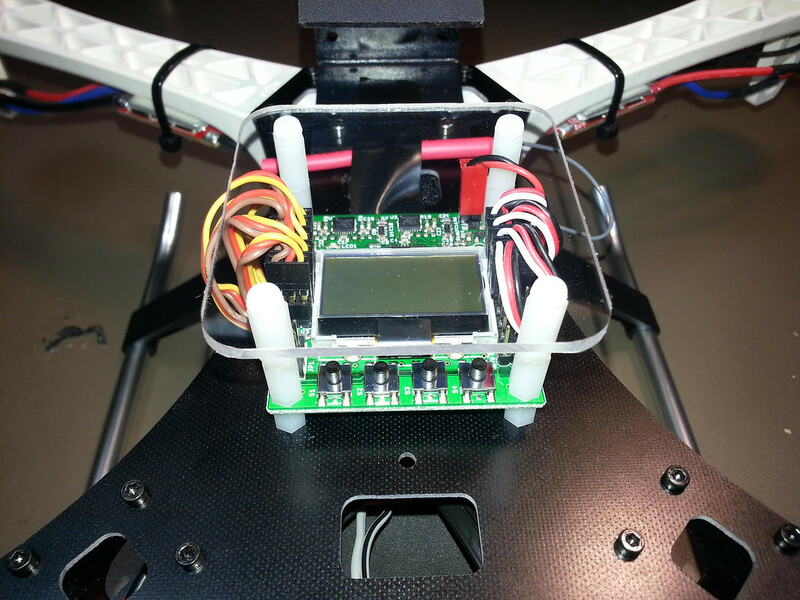 The black piece you see on the front of the frame with a hole in it will be for the FPV camera. This is just a simple mount I made for now out of Kydex. 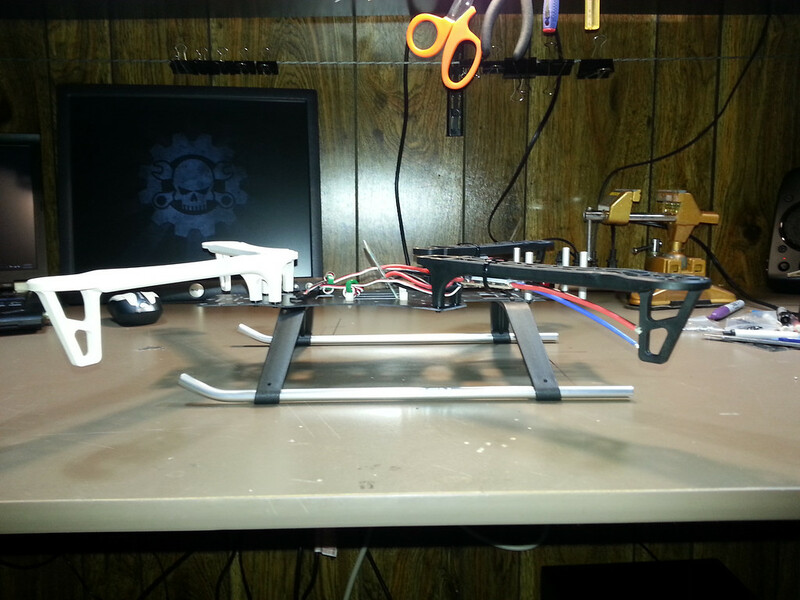 I will make a nicer mount once I know for sure where the FPV camera needs to be placed. This might change once I have the GoPro gimbal fabricated and mounted on the front. 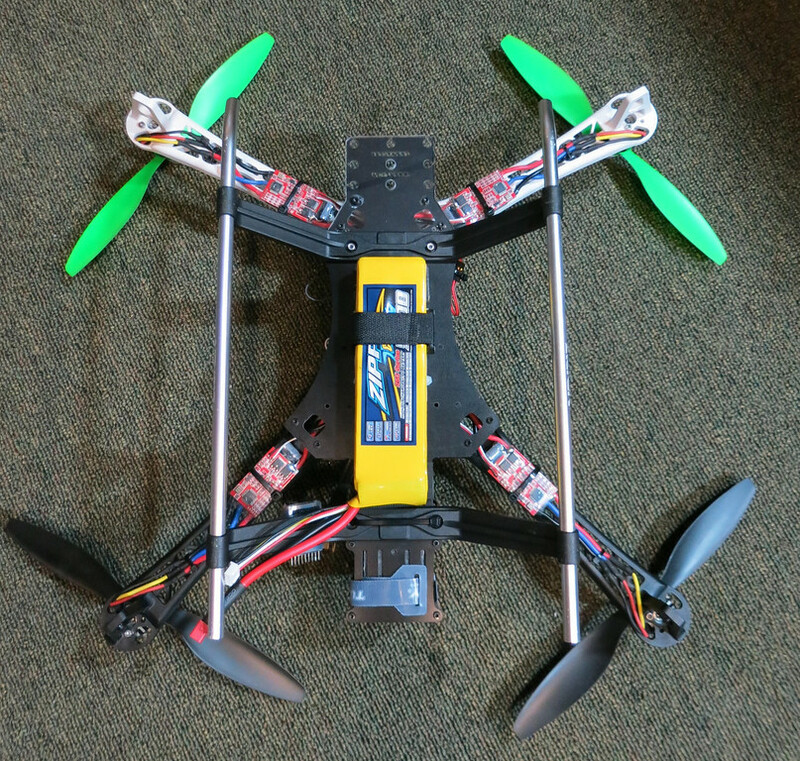 I tried mounting the 500mAh battery in the back of the frame where it should be, and while it did fit just fine, it made the quadcopter extremely back heavy. This might work out once I have all the camera stuff on the front, but for now I mounted it under the center of the frame. My AUW (all up weight) right now with the 5000mAh pack is 1480 grams. But I seem to need about 60 to 65% throttle to hover. Not sure that is very good, maybe some settings tweeking will help this? Or may have to jump up to larger props. Its fine for now, but I am worried about once the GoPro and gimbal are on it. Thats all the updates for now, more to come once I have the GoPro gimbal and FPV installed.